(Note: This modified progression exists largely due to a a normal 20 HD copper dragon being 6 CR lower than a normal level 20 character, thus this progression is LA+0, provided it is not combined with class levels. Compared to a 'normal' copper dragon, the casting and damage reduction have been improved by moving their progression forward 3 age categories; SR and frightful aura start 3 categories earlier, though are otherwise unchanged; the SLAs, which previously started at 20HD, have been moved forward and expanded upon, with the uses/day modified for increased flexibility; there is a +4 racial bonus to acrobatic/climb checks; and lastly, 'stone cunning' and 'earth glide' have been added). Copper dragons have a well-deserved reputation as incorrigible pranksters, joke-tellers, and riddlers. They appreciate all forms of humor. Most are good-natured but also have a covetous, miserly streak. When building hoards, copper dragons prefer treasures from the earth. Metals and precious stones are favorites, but they also value statuary and fine ceramics. Unlike most dragons, copper dragons are often happy to have cramped lairs that don’t allow them space for flight; they depend instead on their ability to climb stone surfaces for mobility inside the lair. Copper dragons are known to eat almost anything, including metal ores. However, they prize monstrous scorpions and other large poisonous creatures. (They say the venom sharpens their wit; their digestive systems can handle the venom safely, although injected venoms affect them normally.) They are determined hunters. They consider good sport at least as important as the food they get, and doggedly pursue any prey that initially eludes them. A copper dragon would rather tell a riddle or a pull a prank than fight. Any copper dragon appreciates wit wherever it can be found, and will usually not harm a creature that can relate a joke, humorous story, or riddle the dragon has not heard before. The dragon quickly gets annoyed with anyone who doesn’t laugh at its jokes or accept its tricks with good humor. Copper dragons love being the center of attention and do not appreciate being upstaged. When cornered, a copper dragon fights tenaciously, using every trick it knows to defeat the foe. Copper dragons show similar aggression when defending lairs, mates, or offspring. In most other circumstances, a copper dragon prefers to outwit and embarrass a foe. To a copper dragon, a perfect victory comes from taunting and annoying an opponent into just giving up. In any situation, copper dragons favor thinking and planning over brute force. They often deal with superior foes, such as red dragons, by drawing them into narrow, twisting canyons or tortuous caves where they can use their climbing ability to outmaneuver the foe. Copper dragons are powerful jumpers and climbers, with massive thighs and shoulders. A copper dragon’s head has a short face and no beak. Broad, smooth browplates jut over the eyes, and long, flat coppery horns extend back from the browplates in a series of segments. The dragon also has backswept cheek ridges and frills on the backs of the lower jaws that sweep forward slightly. Layers of triangular blades point down from the chin, and as the dragon gets older more layers with larger blades develop. The dragon has a long tongue that comes to a single point. At birth, a copper dragon’s scales have a ruddy brown color with a metallic tint. As the dragon gets older, the scales become finer and more coppery, assuming a soft, warm gloss by the young adult stage. A very old dragon’s scales pick up a green tint. A copper dragon’s pupils fade with age, and the eyes of a great wyrm resemble glowing turquoise orbs. Copper dragons have a stony odor. Copper dragons have mantalike wings that show green and red mottling along the trailing edges. The upper alar limb is exceedingly short, giving the leading edges of the wings a Ushaped profile when viewed from below. The wings run down the dragon’s entire body, almost to the tip of the tail. The main portion of the wing is supported by three phalanges and a modified alar olecranon. Spines sweeping backward at an angle from the backbone support the remainder of the wing. A copper dragon’s distinctive wing profile makes it easy to distinguish from the brass dragon, which can occupy similar habitats. Base attack bonus equal to total Hit Dice (as fighter). +1 natural armor bonus per Racial Hit Dice, excluding first. A dragon's class skills include Concentration (Con), Diplomacy (Cha), Escape Artist (Dex), Intimidate (Cha), Knowledge (any) (Int), Perception (Cha), Sense Motive (Cha), and Use Magic Device (Cha). Skill Points at 1st Level: (6 + Int modifier) × 4. All of the following are racial features for true dragons. 1. A dragon’s bite attack has reach as if the creature were one size category larger. All other attacks are made with the standard reach for the dragon’s size. At a certain age dragons can unsettle foes with its mere presence. The ability takes effect automatically whenever the dragon attacks, charges, or flies overhead. Creatures within a radius of 30 feet × the dragon’s age category are subject to the effect if they have fewer HD than the dragon. A potentially affected creature that succeeds on a Will save (DC 10 + ½ dragon’s HD + dragon’s Cha modifier) remains immune to that dragon’s frightful presence for 24 hours. On a failure, creatures with 4 or less HD become panicked for 4d6 rounds and those with 5 or more HD become shaken for 4d6 rounds. Dragons ignore the frightful presence of other dragons. 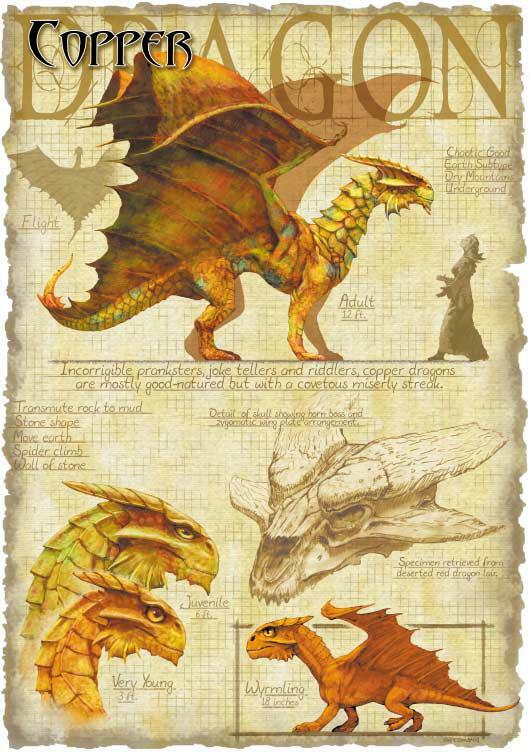 A dragon’s spell-like abilities depend on its age and variety. It gains the abilities indicated for its age plus all previous ones. Its age category or its sorcerer caster level, whichever is higher, is the caster level for these abilities. The save DC is 10 + dragon’s Cha modifier + spell level. Some dragons have damage reduction. Their natural weapons are treated as magic weapons for the purpose of overcoming damage reduction. All dragons have immunity to sleep and paralysis effects. Each variety of dragon has immunity to one or two additional forms of attack no matter what its age, as given in its description. As dragons age, they become more resistant to spells and spell-like abilities, as indicated in the variety descriptions. Dragons can pinpoint creatures within a distance of 60 feet. Opponents the dragon can’t actually see still have total concealment against the dragon. A dragon sees four times as well as a human in shadowy illumination and twice as well in normal light. It also has darkvision out to 120 feet. Chromatic and metallic dragons are exceedingly strong flyers and can cover vast distances quickly. Dragons do not tire as quickly as other creatures when moving overland on the ground. If a dragon attempts a hustle or a forced march, check for nonlethal damage once every 2 hours instead of every hour. A copper dragon has two types of breath weapon, a line of acid and a cone of slow gas. Creatures within the cone must succeed on a Fortitude save or be slowed for 1d6 rounds plus 1 round per age category of the dragon. A copper dragon can climb on stone surfaces as though using the spider climb spell. Stonecunning (Ex): This ability grants a copper dragon a +2 racial bonus on Search checks to notice unusual stonework such as sliding walls, stonework traps, new construction (even when built to match the old), unsafe stone surfaces, shaky stone ceilings, and the like. Something that isn’t stone but that is disguised as stone also counts as unusual stonework. A copper dragon who merely comes within 10 feet of unusual stonework can make a Search check as if he were actively searching, and a copper dragon can use the Search skill to find stonework traps as a rogue can. A copper can also intuit depth, sensing his approximate depth underground as naturally as a human can sense which way is up. Coppers have a sixth sense about stonework, an innate ability that they get plenty of opportunity to practice and hone in their underground homes. An adult copper dragon can glide through stone, dirt, or almost any other sort of earth except metal as easily as a fish swims through water. Its burrowing leaves behind no tunnel or hole, nor does it create any ripple or other signs of its presence. A move earth spell cast on an area containing a burrowing copper dragon flings the dragon back 30 feet, stunning it for 1 round unless it succeeds on a DC 15 Fortitude save. Usable, collectively, (Charisma modifier + age category) times per day (per house rule). Bluff, Stealth, and Acrobatic, are considered class skills for copper dragons. Copper dragons have a +4 racial bonus to Acrobatics and Climb checks due to being excellent climbers and jumpers. (1) Can also cast cleric spells and those from the Chaos, Earth, and Trickery domains as arcane spells.